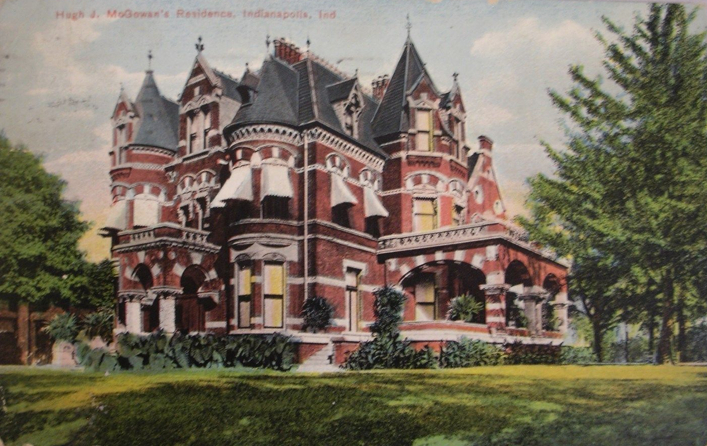 Concluding Preservation Month at HI, we examine one of the biggest residential architectural murders perpetrated upon the citizenry of Indianapolis. It’s hard not to wince when passing the northeast corner of 13th and Delaware, knowing that the spires, towers and turrets of the long-gone castle should be regally climbing into the sky. Instead, a lumpy parking lot betrays something lurking beneath the surface: a graveyard. The architect of the dearly departed building was William LeBaron Jenney (25 September 1832- 15 June 1907), best known for his large commercial buildings, but also as the pioneer of skyscraper design and for his affiliation with the Chicago School of architecture. 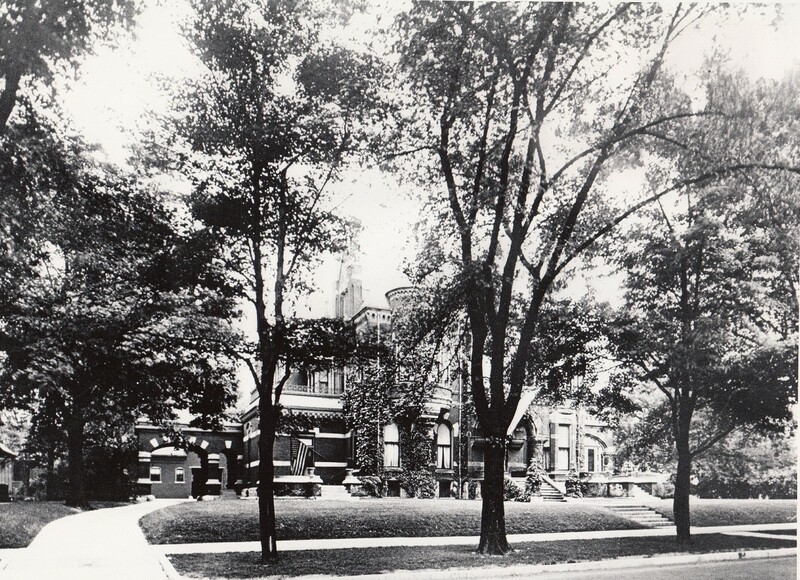 Jenney moved to Chicago following the Civil War in 1867 and began his own architectural office, which specialized in commercial buildings and urban planning. If you’ve never seen or heard of the Ludington Building in Chicago, check out this article, identifying the building as the earliest surviving steel-frame building/ skyscraper, clad in terra cotta, and brainchild of Jenney. Word is, that student draftsmen who learned from Jenney included Daniel H. Burnham, Louis Sullivan, Martin Roche and William Holabird. And, long before Frank Lloyd Wright worked with the innovative open floor plan, Jenney had designed a Swiss Chalet style home with that concept. For a far better (and quite entertaining) account about Jenney, click here. 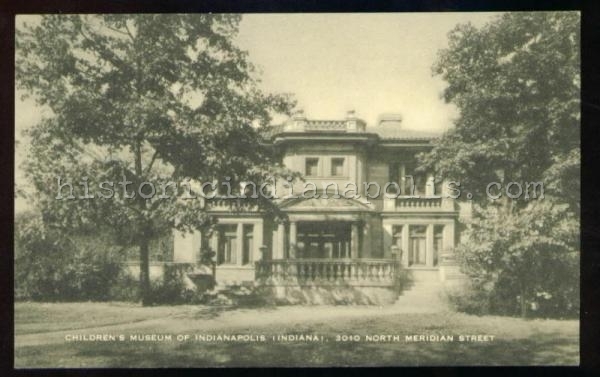 Today’s subject is not such a deep loss merely because a renowned architect designed it, or its aesthetic merits, but the home’s story and inhabitants who also left marks on the city of Indianapolis. 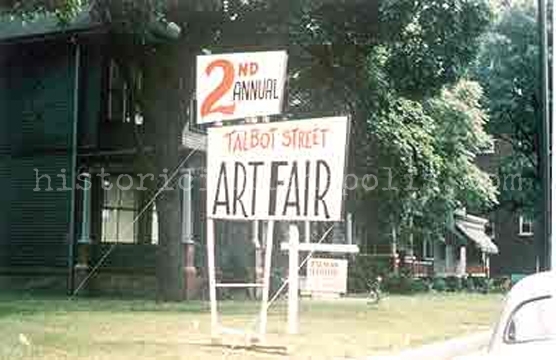 This was what Booth Tarkington had in mind when he wrote “the house was the pride of the town.” It being the model for the home of The Magnificent Ambersons, even if, in Tarkington’s made-up world, the residence was part of a Woodruff Place-esque setting. The elaborate abode was conceived by Hervey Bates, Jr, and wife after a trip to the Loire Valley in France. The ultimate construction cost of the house was estimated at $80,000, in 1874. That, of course, was in addition to the thousands to purchase the 200 x 195 (R.B. 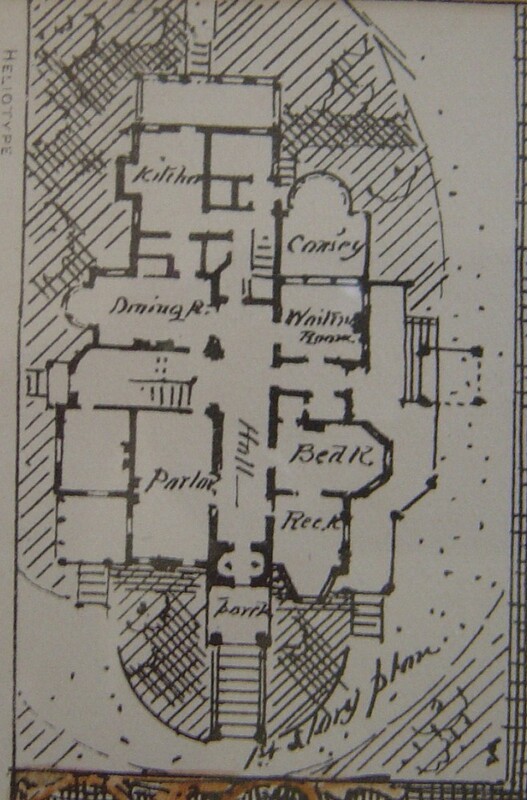 and J. S. Duncan addition) lot upon which the castle was built. And how did Monsieur Jenney come to Indianapolis to construct this edifice? Wilmer Christian and James Shover, local contractors who helped build it (in addition to the new Bates Hotel, The When building, and many others) put Jenney and Bates in touch. In Mr. Christian’s words: “Of course, I know about the Hervey Bates house, I helped to build it. I had been in Chicago adjusting fire insurance losses after the great fire and I met there Mr. Jenney, the architect, who was building some fine new houses on the North side. I told Mr. Bates about the work Mr. Jenney was doing with Ed May, the architect of the Statehouse, [who had] also praised him. 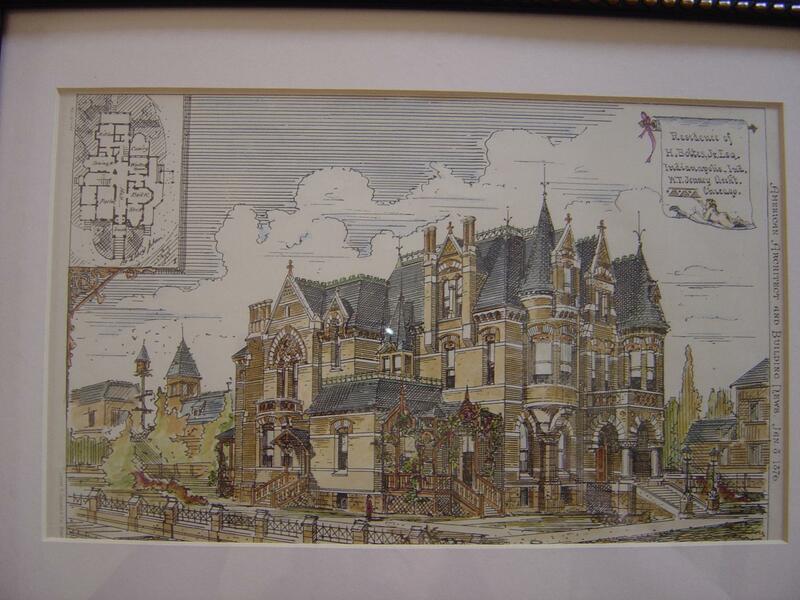 Mr. Bates had brought back from Europe the designs of the kind of a house he wanted to build. Mrs. Bates had made drawings of the general arrangement of the rooms, but they were not working plans.” Hence, the need for an accomplished architect. “Above the fireplace in the library, down the cross hall was a Latin inscription which translated to ‘Life without books is death.’ The doors of the house were heavy and high. The ceiling there was high, and the parquetry floor laid in diagonals. Glass-fronted cases lined the walls. The names of four poets—Homer, Sappho, Byron, and Burns—were carved above a window. But the most unusual decoration was found in the dining room. 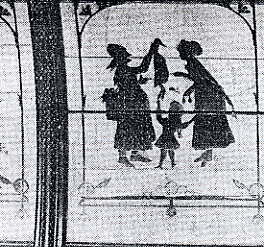 Inlaid black and white panels there depicted English storybook figures—a fisherman with his pole and catch, a jolly butler with a game pie held high, a jester with cap and bells, such as that. The panels appeared throughout the room, figures of game birds over the sideboards, figures of animals and children in a central space.” The house was finished throughout with some of the best quality wood available: curly white walnut, black walnut, holly and ebony among others. 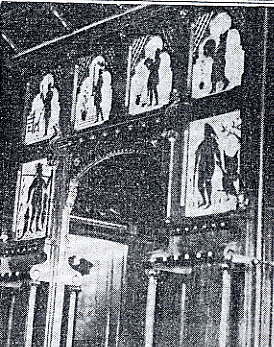 Jenney reportedly selected the artists who made these panels, as well as the furniture makers and wood carvers. 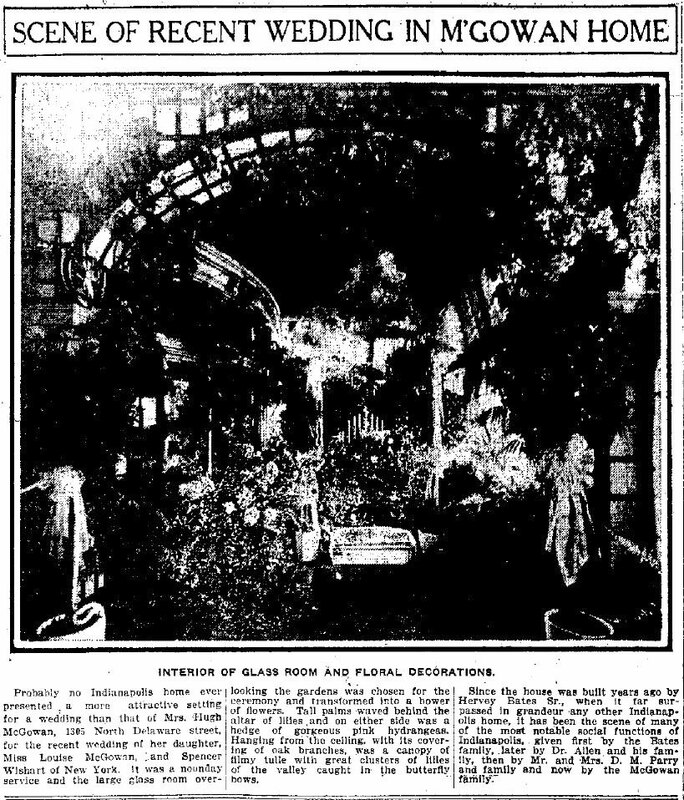 The earliest known photos of the home show a long wood frame porch on the south side of the home. Later photos show the removal of this porch and the addition of a porte cochere, that was later enclosed. After the home was sold to the Knights of Columbus (for a pittance) in the early 1920s, there were further alterations to the building—including all that remains standing today—an auditorium addition built in 1922. Four families occupied the home before the Knights of Columbus took ownership. Following the Bates family, who lived there until the fall of 1880, it was sold it to Elijah B. Martindale, who sold it the following day to Dr. Horace Allen and his wife, Harriet. The Allens lived in the home for the next sixteen years. Their four children ranged in age from eight to twenty-one. The twenty-one year old, Miss Harriet Allen was reportedly the model of Isabel in The Magnificent Ambersons according to Mrs. Donald Jameson, niece by marriage of Booth Tarkington. The aforementioned little studio off the ballroom was her art studio. She married in 1883. 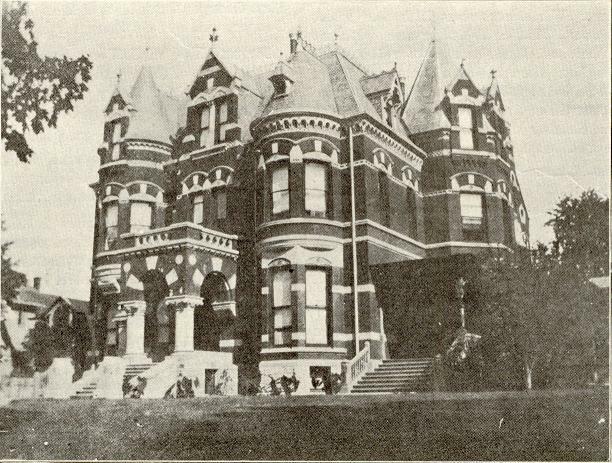 One of the most notorious fires in Indianapolis history occurred at Dr. Allen’s National Surgical Institute in January 1892. There were many deaths and injuries and Dr. Allen was unable to re-establish his hospital after that tragedy. Presumably, this played a part in the family’s exit from the home. The home was next sold to David M. Parry and his wife. They changed the driveway from the south to north side of the home and the city’s address numbering changed that of this home from 679 to 1305 North Delaware Street. At the time, Parry had established himself as a prosperous and self-made buggy manufacturer after trying out a number of vocations. Around 1890, he began manufacturing four-wheeled vehicles: piano-box buggies, surreys, phaetons, and road and spring wagons. This later became the Parry Auto Company. D. M. Parry had also become president of the National Association of Manufacturers and had considerable influence. The Parrys left the Delaware Street home in 1903, relocating to a 100-acre estate near the old Country Club and built a house there. The area is now known as Golden Hill. 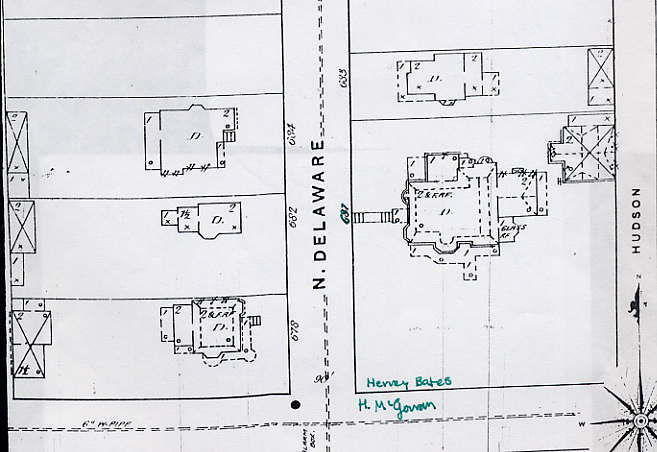 The final family to reside at 1305 North Delaware Street was the Hugh McGowan family. As with Parry, McGowan was a self-made man. He worked fifteen to eighteen hour days and was dearly respected by those who worked for him. From a Missouri farm boy to raking cinders under a Wabash locomotive, McGowan exemplified the American Dream of turning hard work and brainpower into an improvement to the world, and made himself rich in so doing. Hugh and Kate McGowan had four daughters, were members of the Art Association and the Country Club and had a second home above Broad Ripple, listed as “S.R. Williams Creek, Indiana” in the 1910 Blue Book. Though unverified, one account has the home where the current Blind Institute Stands on a property on North College. In other McGowan related news, the Indianapolis Museum of Art, displays a small woven Indian basket, donated by Mrs. Kate McGowan in one of the older sections of the museum. How did this little basket fit into the decor scheme in the giant mansion on the corner of 13th and Delaware. Where would it have been displayed? It would be interesting to locate relatives of the four daughters. Virginia Keep Clark composed a portrait of the young ladies in the 1890s. One of the daughters married and moved to England. Miss Louise McGowan married race car driver, Spencer Wishart, who came in 4th place, driving a Mercedes, at the 1911 “Indianapolis race,” as it was referred to, and in 2nd place in 1913, behind the wheel of a Mercer. He participated in each “500-mile international sweepstakes at Indianapolis,” until his tragic early death at age 24, in a race in Elgin, Illinois in August 1914. The other daughters have been more difficult to trace and there has been scant available information on them. This invites the audience participation part of our site. 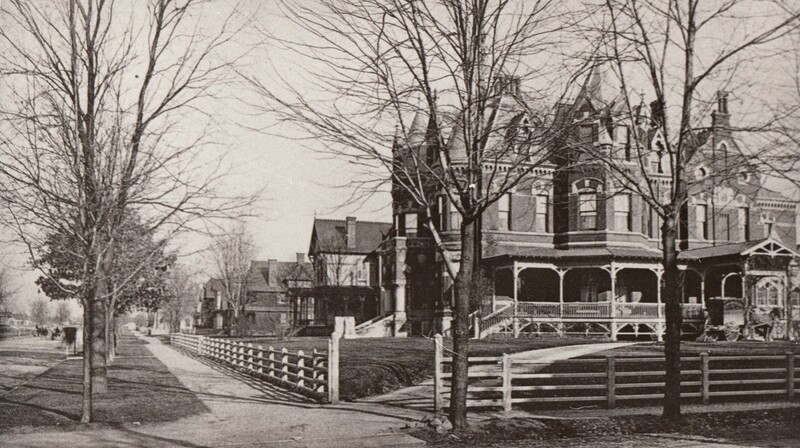 After Hugh McGowan died at home in December 1911, age fifty-four, Mrs. McGowan continued living at the home for a number of years before relocating to the Spink-Arms on Meridian Street. She sold this glorious mansion to the Knights of Columbus for a fraction of its worth. And this generous, but tragic choice led to the demolition of one of the most storied, beautiful and worthy homes in the city of Indianapolis. So now, rather than an impressive castle envisioned by one of the city’s earliest pioneers, constructed by some of the most prolific contractors, planned by the father of the modern skyscraper, inspired by Chateaux of the Loire Valley, experienced and enjoyed by decades of Indianapolis’ most notable citizenry and immortalized in a way by “The Magnificent Ambersons,” there is a wavy parking lot (the home and its rich woods, stones and bricks under that uneven asphalt), and a frequently smoke-filled bingo parlor for the Knights of Columbus, Council 437 that remains. This is why preservation is essential and so deeply moving. Had someone had a little foresight, a little heart, a little imagination—this would still be one of the tourist attractions of the city—as it was listed in many tourists booklets throughout the early decades of the 20th Century. 1963 is a year that will forever mar Indy’s architectural history. NextWTH Weds: What’s the Worth? I have asked the Knights of Columbus if they could track down the vintage sign and any other architectural elements. We’ll see what they come up with. I can just imagine the secret passages in this incredible estate. . .
Hey Sandra! We have sure tried. No luck so far…Let me know if you hear anything! About 20 years ago I lived in the condos at the corner of 13 and Alabama..some one told me they were built upon the debris of an old home that was demollished years prior to 1990..I don’t think it was the McGowan house..but the one behind it on 13th street..yes, such a tragedy like so many in this city..
How different the Circle would be if they kept the English Opera House..We need to perserve our heritage..
Hugh McGowan used to attend St. Joan of Arc church and was a lovely and generous man. His son and now his grandson own an insurance agency. I’m sure you can find it in the phone book. Your story about this home was very interesting and I enjoyed it very much. Different Hugh–a nephew of the one featured in the story. I’ve met a couple of the McGowans–indeed, very nice. How interesting this article!! I have been in the KofC Building many times since 1978 and I never knew the history of the building. Was the McGowan home torn down except for the gym? I always thought the basement was different from the rest of the building and now I know why. Why did the KofC make changes to this beautiful home? I thought I said it in the article, but yes, all but the ‘gym’ was torn down and because of high heat bills and maintenance. I spoke with Mr. Bob Braun who was president of Historic Landmarks Foundation of Indiana at the time, and he said he BEGGED them to reconsider, but they would not be prevailed upon. They said the house was old and in poor condition. (To which I say: who’s fault is that?!) sniff, sniff. One of the biggest architectural losses to this city, EVER. Very interesting website. Thank you for all of your insight. Great article! It is so sad that this home no longer exists. This had to have been the most beautiful home in all of the midwest. If it were still standing today, it would probably still be the most beautiful home in the midwest. Shame on them for destroying it! Hopefully they can save the Gamble House in Cincy. That too is a beautiful home! Thanks for this article, my grandmother was a cousin of Spencer Wishart who married Louise McGowan in 1914 in this beautiful home, so I was glad to see the information. I have often wondered what happend to Louise after Spencer’s death, I have found a great deal written about him but virtually nothing on her. What a gorgeous home — and what a shame it is no longer there. My name is Douglas Kiovsky and I’m a member with the Roebling Museum in Roebling, NJ. The museum is dedicated to anything regarding the town, family, and their contributions to society like the Brooklyn bridge. At the turn of the 20th century, the family helped to establish the Mercer automobile. As you know, Spencer Wishart was an early pioneer of automotive racing and drove Mercer cars for the last two years or so of his life. Sadly, his early life came to an end in one. What we would like to do is have a small exhibit at the museum honoring the Mercer car and its early drivers. Although I have found photos on ebay of drivers such as Ralph DePalma and Barney Olfdfield, finding anything on Spencer Wishart is extremely hard. Does your family have a photo or personal item that belonged to him that the museum could have to tell the story? Any original items are great but if you don’t have one, a copy of a photo will do. Hi Doug — Nice to hear from you! Unfortunately I don’t have any original photos of Spencer Wishart, although I’ve been able to find several reproductions online through Google Images. 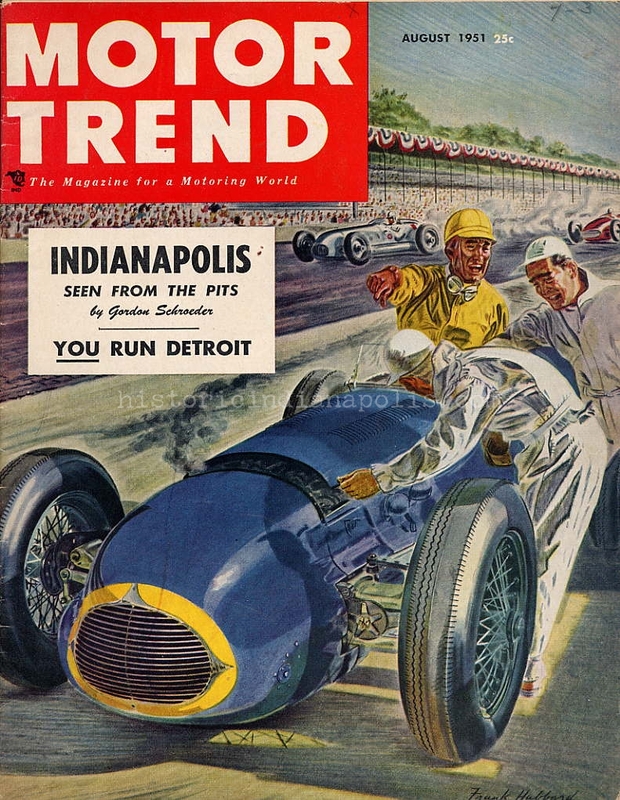 Most of what I know about Spencer was either relayed to me by my dad, whose mother was Spencer’s cousin, or gleaned from research online and in various books about the early days of racing. I hope you do find something! My husband is from south NJ (Salem) and the next time we get up home we’ll make a point of checking out the museum at Roebling. Good luck! This building is not culturally relevant, Its just a grand old home that had its day in the sun. Though as nice and significant as you may find it to be its not culture, or at least relevant culture. Your mistaking someones lavish home, foppery if you will for anything of import. Concentrations of wealth were great especially before personal income tax, so of course the robber barons of their day could build to excess. unmitigated ego and greed drove the building of these idolic structures. Most people of means in their day were in a great competition led mostly by dithering idiots (aka Victorian wives) to build the most, the greatest, to stand out amongst those with real money or real power. If i had to take a wrecking ball to every last one of these grotesque and outlandish avaricious tombs of greed, to give but one meal to a homeless person, or one shoot in the arm to a poor child i would. Omar, you’re entitled to your opinion, but you are speaking in sweeping generalizations rather than specifically about this home and the people who lived here. Maybe you didn’t read the article or maybe I didn’t write a good enough or clear enough article, but this home inspired Booth Tarkington and was home to some of the earliest settlers of Indianapolis–some of whom started with nothing and worked hard to make their way in the world. 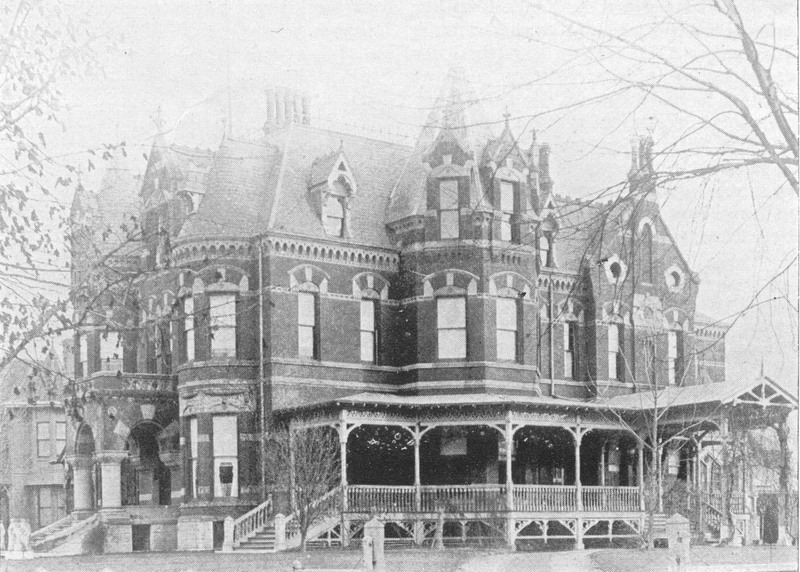 The Bates family owned one of the most successful early hotels in Indianapolis, so I don’t think the “robber baron” moniker applies. And, the notion that taking a wrecking ball to a beautiful historic home somehow equating to a meal for someone homeless…sounds bizarre and nonsensical. Helping homeless people may be a noble endeavor, but it has nothing to do with the existence of the home of someone well-to-do. There will always be large, perhaps ostentatious homes, belonging to wealthy people–wrecking historic homes is wasteful and sad. Tiffany gave a good response, but I would just add that your comments are crazy and absurd. As Tiffany noted, the individuals in the family that originally built the home were not “robber barons.” The home is culturally relevant as it inspired a great piece of literature. It is also historically relevant because of the individuals who lived in it. Finally, tearing down a historic home (or any home for that matter) would not provide a meal or a shot to anyone. Demolition would just waste many thousands of dollars that could go instead to provide food and medicine to someone in need. Also, wrecking a viable structure is not an environmentally friendly action, and it is a huge waste of resources, in addition to the money wasted. If you truly care about helping those in need, then instead of posting insane comments you should go out and volunteer at a charity with a mission you support. It is shocking to me that Omar and others share this mentality. He knows nothing about Bates yet he generalizes and states that he was a robber baron. Does he know this for a fact? I think it is jealousy. He’s prolly jealous of the guy up the street from him with a nicer house. He’s prolly jealous of the guy with a nice sports car. There’s a name for people like you. We call them “haters”. What a great article on a little piece of history that has been all but forgotten! Thank you for sharing. Great article Tiffany. I share your passion for Indianapolis history, culture and architecture. The connection to Spencer Whishart was a delightful surprise. One more photo (I think). A fascinating and thorough account of one of Indianapolis’ grand estates. Pardon the short novel that is about to ensue. When I joined the Mater Dei (mother of God) Knights of Columbus council in 2013, I was dismayed to learn that my earlier brothers felt they had no other choice but to demolish this beautiful home. I have always had an appreciation for historic architecture and preservation, and was almost grief-stricken when my fellow Knights took me upstairs to the Grand Hall for the first time and showed me the doorway that used to lead into the McGowan home as we call it. No doubt Hugh contributed greatly to the charitable interests of the Knights, and his contributions, combined with the sale of stock much like the turnvereins who built the Rathskeller, also facilitated the growth of the Knights’ physical assets. 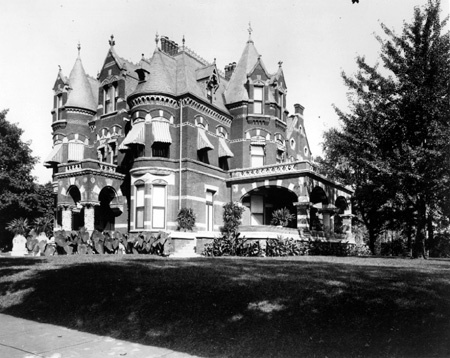 After Hugh’s death, the family connection led to the purchase of the ‘castle’ at 1305 N. Delaware from Mrs. Hugh McGowan in 1919. At the height of its membership (over 2,000 at the time), the chapter constructed the auditorium building, adjoined to the mansion, in 1922 that still stands today (rumored to contain an indoor swimming pool and bowling alley at the time of its construction). The chapter enjoyed a thriving membership base and the auditorium/mansion were host to many charitable fundraisers and social events. I met a woman a couple weeks ago who said her father boarded up in a bedroom upstairs in the home as he underwent a program similar to AA in the 1950s. The building withstood the great depression and world war 2 before membership decline and urban sprawl finally started to take its toll on the vitality of the council in the 1950s. 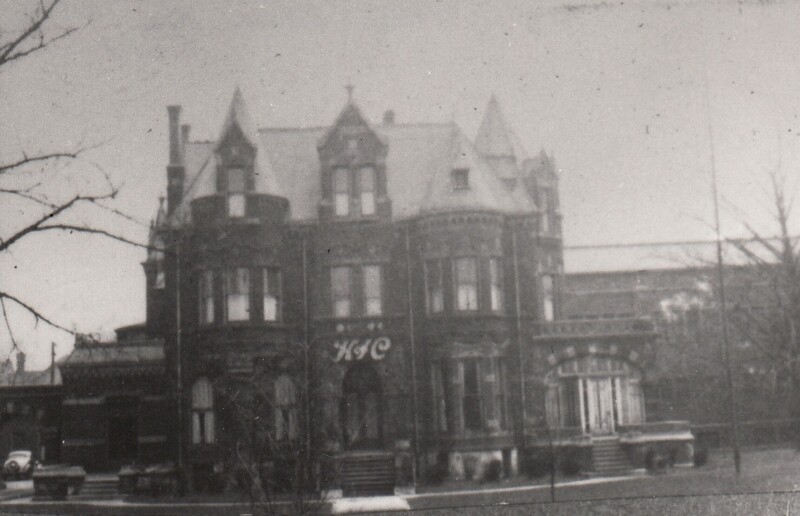 As other K of C councils sprouted up across the city, membership disbursed and according to meeting minutes, expenses outweighed revenue for years before the mansion’s demise in 1963. The 60s was a strange time in many ways, and the prevailing attitude in many organizations was progress and change. 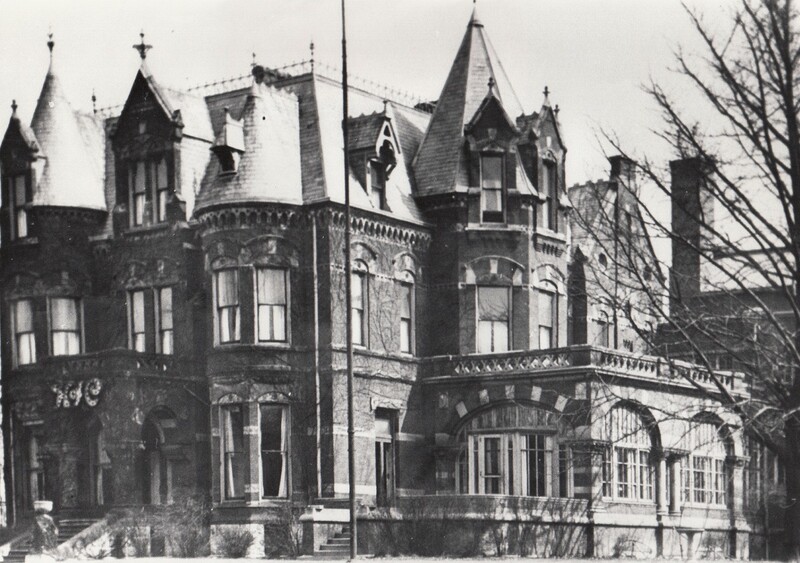 The national registry of historic places and the Indianapolis Preservation Commission weren’t founded until 1965…sadly, 2 years after the mansion was gone. I appreciate Mr. Braun from Indiana Landmarks pleading with leadership to keep the structure, but I would ask, were there anywhere near the amount of resources and funding available to save aging structures such as this as there are now? Thank goodness there are people like you, Tiffany, to advocate for these buildings rich with history. They do indeed enrich our cultural heritage. Along with many other members of our chapter, I catch myself staring at that doorway in the auditorium, thinking that if I had a strong enough imagination, that home would reappear and I could walk right into it….If you think there is anyone that mourns the vacancy of that masterpiece more than the current members of the K of C council, you’re dead wrong. Although not as elaborate and intricate as the McGowan mansion, we think our current structure merits preservation, and we are doing our best to hold on to what we still have…Visit our website to learn more: http://www.kofc437.com. It is my hope that the Knights of Columbus will be remembered more in this city for the countless service hours and charitable contributions than for demolishing a beautiful home. One can only hope. Again, thank you for your love of history and preservation. To anyone still reading, feel free to drop by sometime, and I’d be happy to show you around over a cocktail. A FASCINATING article and one that I have printed out to keep and share–and my comments relate to some of the names which leapt out to me as I read the article–not relevant to the subject but perhaps my own memories (at age 92) might augment —particularly since some of the names mentioned in the article popped up during my career as a reporter, columnist for the Indidnapolis TIMES–the actual articles can probably be found in the state library since regretfully I did not keep all my most “fun” clippings. First, however, the name Virginia Keep jumped out at me. I have some books which wonderful long-ago Elizabeth Eitel Miesse (beloved niece of James W.Riley, daughter of banker Edmond Eitel and a belle of the ball in her youth who also lived into her 90’s) When she was a young elegant lady she and other daughters of families of means volunteered at the then-new Children’s Museum–and she kept into old age some wonderful books which she gave my daughter Kelly Mikels Shea–and which we still have . 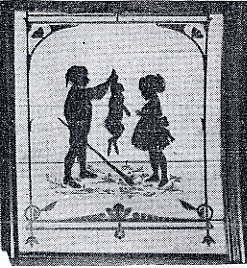 The Virginia Keep book is I think “The Book of Living Dolls” or something close. I have kept it during a recent move and downsize because a motivated collector of historic ephemera Andrew Potts has a consuming interest in –and probably much more knowledge of–ViKeep than I. So that is point No. 1. Part 2 above comment–I ran out of space–to resume “and neophyte reporter D Mikels who didn’t know a Cathcart from an ice cream cart. But that day had already started out bad-Friday was the day we had to turn in our expense accounts–and a New Edict from on high had set up a new rule–NO MORE MISCELLANEOUS! From now on, even a .20 cent taxi tip had to be documented with A WRITTEN RECEIPT!!! No More Miscellaneous–and his assignment interrupted my attempts to itemize some l0 cent bus tokens! But to be told was to obey in those Front Page Days–and even as we were leaving Heinke was instructing “get a picture of the cat with a toothbrush and be sure to get both Cathcart sisters…” etc etc etc. So, off we went, to the southeast corner of 9th and Pennsylvania Street–a several-storied apartment building you entered from 9th St…up a few stairs as I remember, then through a central door to turn left up a few steps where there was a wooden large newel post–and on that large post sat a very large cat. A mean cat! As I climbed to make the turn the cat’s paw lashed out to put a big scratch across my hand–just as we turned the corner to knock on the door of the first apartment. So there we were–Tim carrying the big Speed Graphic camera of the era, me searching for a Kleenex for my bleeding hand as 2 lovely ladies of mature years opened the door to welcome us–and to call lovingly to the monster cat now following uin. When my wound was noticed, and dismissively apologized for with a “oh, dear, that’s Bozo, he loves to sit there as people climb the stairs and sometimes he’s naughty…” etc. “Doesn’t that bother the tenants,” I asked and then one sister indignantly responded “WELL–if they don’t like it they can just move somewhere else!) (actually they couldn’t because the postwar l940’s were the scarcest housing periods in our nation’s history.) But so much for my intro to Bozo. Now on with the assignment. Tim set up his lights, I took notes and spelled names correctly and –remembering the City Editor’s exacting instructions, asked them to pose with Bozo holding his toothbrush so it was visible…”oh my dear–” their answer in unison “Bozo doesn’t like a toothbrush–we just use a soft rag.” Well, they didn’t know Ed Heinke–if he said a toothbrush, it had to be a toothbrush. But fortunately, just across 9th next to the Toodle House (Gee, I remember and miss Toddle Houses) there was a small convenience store–so off I went across 9th and came back with a new l0 cent Tooth Brush (with a receipt!) BUT–when Bozo was posed again–this time with toothbrush–out came that claw and fury erupted–and consternation abounded. The 2 protective Cathcart sisters acted as if we were cat-molesters—BUT I Had An Inspiration: Back I went, across the street–because as I had shopped for the brush I had noticed a small grocery counter with a stack of small tins–SARDINES! So, another purchase–this time .20 cents or so I think and again–I demanded and got a receipt. So–to wrap up this assignment, back I went, off came the little key that unwrapped the flat sardine cat and by now Bozo was as genteel as the little lace doilies on the back of his chair. I rubbed the tooth brush generously into the smelly oily sardines–his mouth opened–the flash camera flashed–the doting 2 sisters smiled lovingly and sure enough–the next day the TIMES ran my somewhat censored feature about the cat-who-liked-having-his-teeth-brushed . (So much for truth in journalism!) And, that would have been the end of this too-long story except, at day’s end, I got back to finishing that incomplete weekly expense account. “taxi to cover fire–.85 cents” “tip-10 cents (no receipt.) “toothbrush for cat-.10 cents (receipt)/ sardines for toothbrush for cat-.20 cents (with receipt.) AND WITHIN MINUTES AFTER I PUT IT ON THE EXPENSE ACCOUNT SPIKE CAME THAT BOOMING VOICE””MIKELS–WHATTHEHELL IS THIS-???? YOU CAN’T TURN THIS IN…..COME UP HERE AND RE-TYPE IT and that is how I became the expense account heroine of the TIMES City Room staff when his voice lowered to a confiding whisper ”’Just Make It Miscellaneous, damn it!!!!? So there==that is my long way of updating at least 2 of the names mentioned in your wonderful story–I later bought and have a little book titled something like “On Our Corner” by the sisters Cathcart with a picture of that building which I wonder if it still stands at 9th and Penn…I am a stranger in my own town downtown anymore. Donna, looks like I found this article a few months after you, but thank you for your story above. I laughed heartily! I just finished The Magnificent Ambersons, watched the film (which was terrible), and presently my brain is completely steeped in turn-of-the-century (the last century, that is) Indianapolis history. This article has utterly broken my heart. What it must have been like to be in the original ballroom and watching a stage performance or listening to the orchestra. A poster above mentioned that the door is at the KofC, I wonder what happened to the rest of the original woodwork? It is indeed a heartbreaking loss. Another reader of HI alerted me to the existence of some of the original woodwork from one of the rooms a few years ago at White River Architectural Salvage. Last I heard, they had taken it to Nashville, TN (their other location), which bummed me out. One of our members, a master carpenter, does restoration work. 100% by chance, he came across a pile of beautiful wood trim with a note, “K of C Mansion.” We pleaded with the owner to sell the woodwork to us. We did not retrieve all of the stock but we did retrieve some.